Joe Bedu hailed from Dafor-Awudome in the Volta Region, and when he sadly died in 2004, the villagers named their Primary School after him. 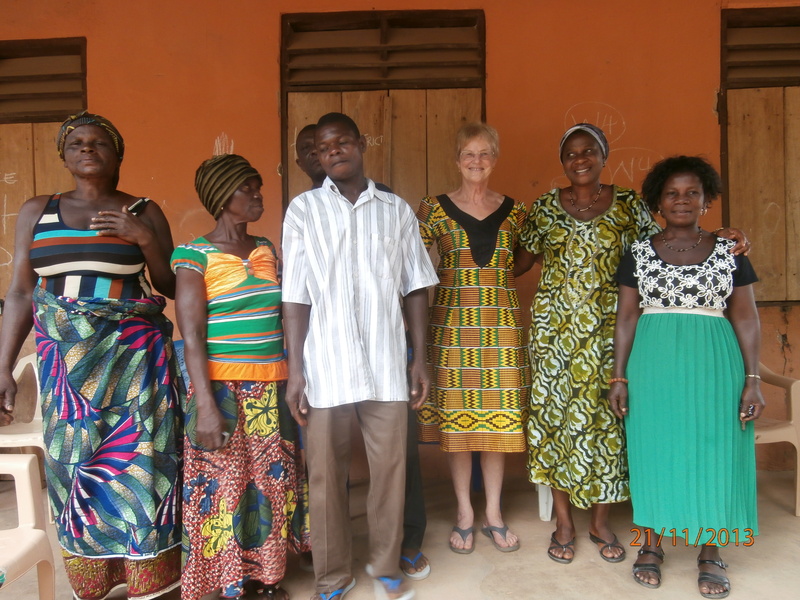 Joe’s widow, Penny Sewell, plus a network of friends, have supported the school ever since. 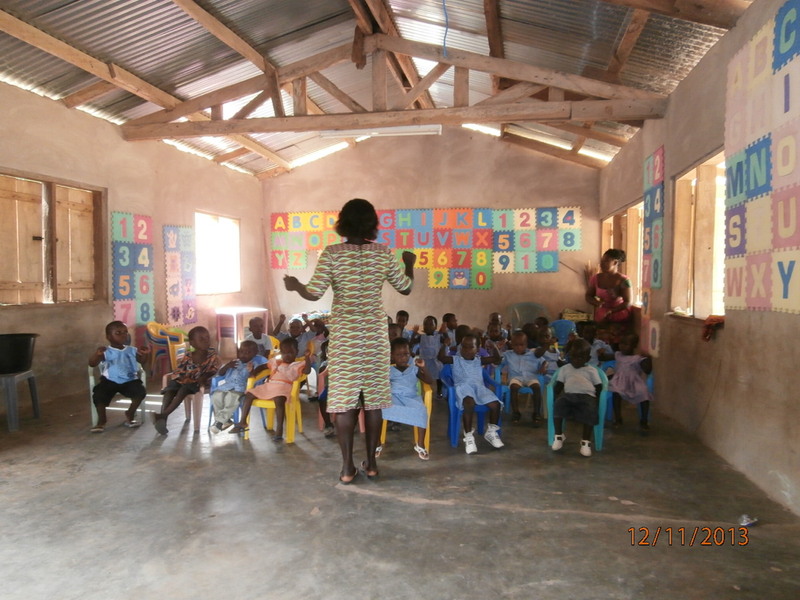 Ghana School Aid has been of immense assistance, giving funding to help with: building a six-cubicle pit lavatory (Kumasi Ventilated Improved Pits); re-establishing electric cables (stolen years ago), thus enabling the school to be lit up again; installing pipes bringing water to four standpipes on the school compound; providing funds for classroom conversion and for making burglar-proof a computer laboratory; supporting the J. Bedu Day-care Centre for toddlers.. The funding received was added to what Penny had raised separately, hence the impressive list of projects. The school roll has increased hugely in recent years, and the school is unrecognisable compared to what it was in 2004 – it is now a force to be reckoned with. Although I observed a definite rise in standards in Ghana, in terms of dress, vehicles and aspirations, there is still a great deal of poverty, which explains the need for security. The school is doing well but much more work is needed to help the children bridge the huge gap between rote-learning and real life. This implies the availability and good use of text books, in-service training for teachers, and strong leadership. In the next year or so the Eastern corridor road from Accra to the North will come into service: it passes in front of the school and will bring changes to Dafor. I asked JH3 (the top class) about those changes, but my question met with silence. Why? I can only think that the topic wasn’t on the syllabus and there had been no discussion either in the village or the school about the road’s impact. The challenge at this level is to think “outside the box” – let life into the syllabus. Who in the school can pick up that challenge? // I left 19 library story books, a volley ball (great acclamation for that! ), 10 big sleeping mats for the little ones, 3 syllabus books, 20 little chairs, 2 bowls and 2 water-barrels. Also pens and pencils for the children and a small cash gift for each member of staff. They were clamoring for football shirts and short, but funds did not stretch that far. The Day Care Centre is flourishing, with high enrolment and, on the whole, happy children. The room they use is nicely decorated with letters and numbers. There’s a lot of reciting and singing – I didn’t see any games being played and the toys were in a chest only brought out on Fridays. Forgive me, teachers, if I have got that wrong, but also, teachers, please make more use of the toys you have. // I discovered that the DCC and the KG children are too small to use the pit lavatories that we provided. (Which, by the way, are much appreciated.) They were creeping into the bushes with their little bits of toilet paper. I had a good discussion with the Chair of the Parent-Teacher Association which intended to build special cubicles (pits with small seats) for the little ones. I left a personal gift to help them complete that project. It is always rewarding and exhilerating to share in the life of the school which is growing in stature and about to face some big changes and opening-up to the outside world. See the pictures below. PTA members with Penny, and the acting Headteacher and her deputy. UPDATE MARCH 2016 Thanks to the generosity of friends, and the great help of GSA, the school has completed the new corridor outside the JHS block (see picture), which will make life a lot more pleasant for everyone using those rooms. 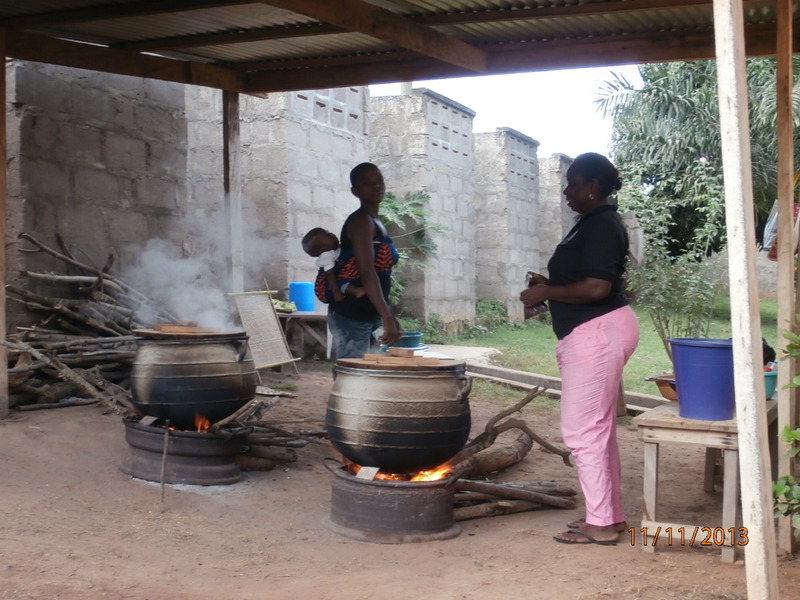 The school continues to get good results at BECE level, with students gaining places in secondary schools. 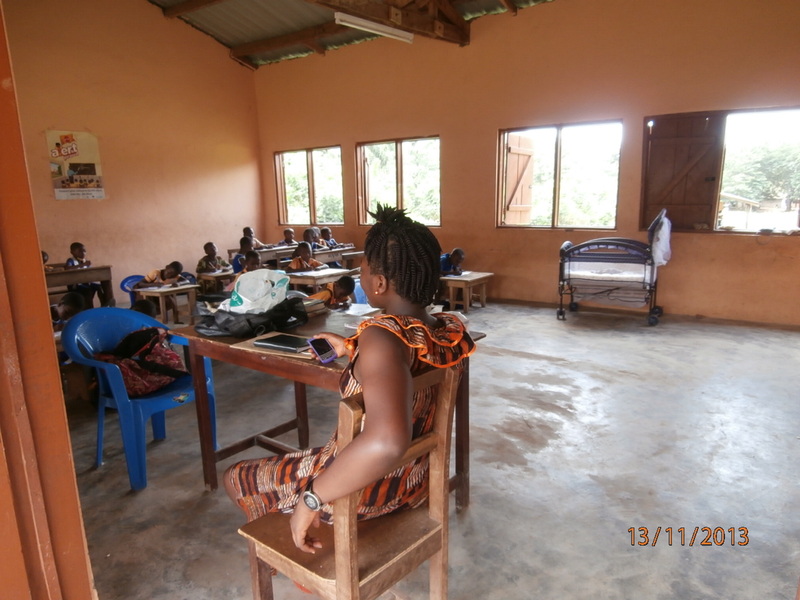 Class sizes in the Kindergarten and the Primary school are 30+, and about 15 in the JHS. Six student teachers from the Peki College of Education join the staff for one year each year and play a significant role in the school. The picture below shows the Committee which administers funds from GSA and the J. Bedu Memorial Fund. UPDATE February 2017 A special appeal was launched by Penny to help this school and the Cambridge-Bethel Schools, an appeal adopted by GSA as its 30th anniversary appeal. A total of £5410 was raised, most of which was eligible for GiftAid. This GiftAid is shared between the appeal and general GSA funds, yielding some £550 for each. The aim of the appeal for this school was to enable it to resurface badly damaged classroom floors and to connect the new staff bungalows to the national grid. These two projects have been completed in record time, and the new Headteacher, Mr. Maxwell Pekyi is bowled over, realising how much his school has benefited from our support over the years. Warm thanks are due to all who supported this initiative financially, to Robert who supervised the work, and to the workers. The new floors look marvellous! 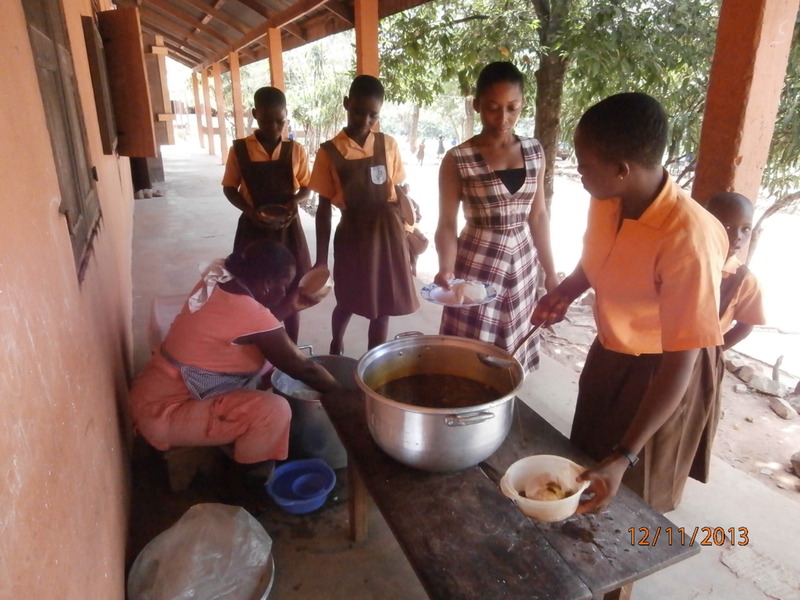 This entry was posted in Projects and tagged Joe Bedu Primary School by Ghana School Aid. Bookmark the permalink.